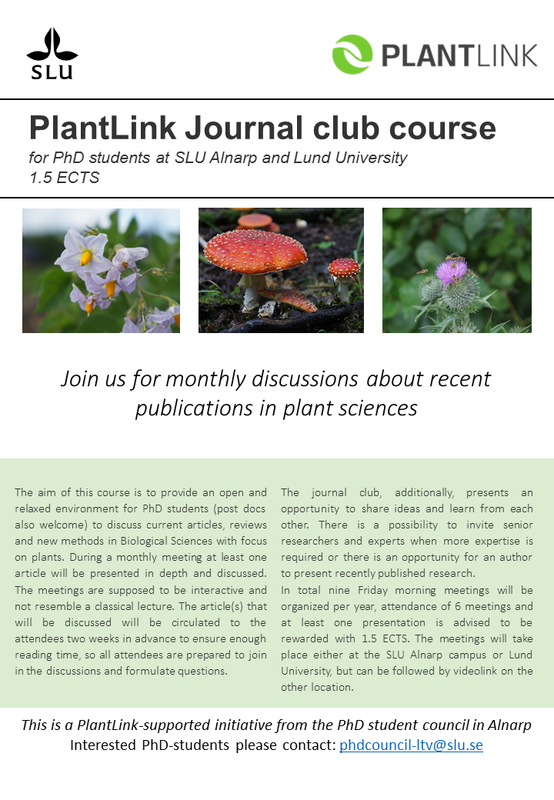 PlantLink > PhD Education > Join the PhD/Post doc PlantLink Journal Club! The aim of this course is to provide an open and relaxed environment for PhD students (post docs also welcome) to discuss current articles, reviews and new methods in Biological Sciences with focus on plants. During a monthly meeting at least one article will be presented in depth and discussed. The meetings are supposed to be interactive and not resemble a classical lecture. The article(s) that will be discussed will be circulated to the attendees two weeks in advance to ensure enough reading time, so all attendees are prepared to join in the discussions and formulate questions. The journal club, additionally, presents an opportunity to share ideas and learn from each other. There is a possibility to invite senior researchers and experts when more expertise is required or there is an opportunity for an author to present recently published research. In total nine Friday morning meetings will be organized per year, attendance of 6 meetings and at least one presentation is advised to be rewarded with 1.5 ECTS. The meetings will take place either at the SLU Alnarp campus or Lund University, but can be followed by videolink on the other location.